One has to be special to catch the attention of former India captain Sourav Ganguly. Ganguly's knack for spotting talent quickly is well documented and he was left awestruck on seeing youngsters Kamlesh Nagarkoti and Shivam Mavi send shivers down the Australian U-19 batting line-up with their impressive bowling speeds. These two bowlers wreaked havoc as India started their ICC U-19 World Cup campaign with a commanding win over the Aussie colts. Talking after the game, Australian batsman and opener Jack Edwards said his team was left surprised seeing how fast the Indian bowlers were bowling, “We thought spin definitely would be their strength. We were aware they had good quicks, but we thought they'd use spin through the middle. They were pretty sharp, I didn't realise it was 145[kph] until one of the boys told me." 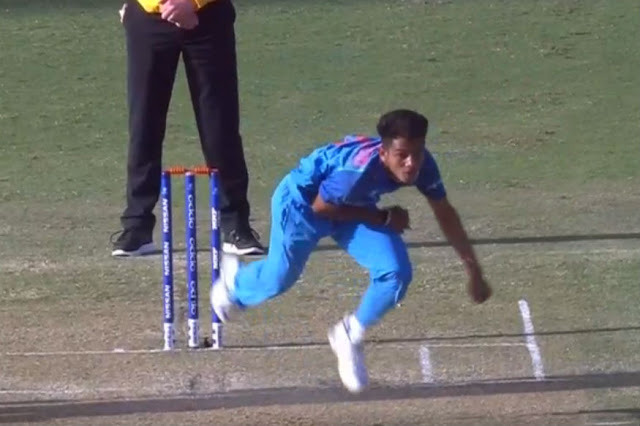 “His action is perfectly supported by his body’s biomechanics and that helps him bowl constantly at high pace at such a young age,” Rathore adds. Ian Bishop was on-air and while explaining and breaking down Nagarkoti’s action, he said "I salivate with these things, it is so impressive." Son of an Army kid, cricket was always high on priority for Nagarkoti. He was first spotted in the cantonment area in Jaipur at the age of 8 and even then he was bowling faster than those bigger to him. When Rathore saw him, he wasted no time, taking him under his wings at his academy in Jaipur where Nagarkoti excelled in all three aspects – batting, bowling and fielding. “He has super quick reflexes, those really help him in the field and his athletic ability makes him easy to spot when you see a game, he is a handy middle-order batsman as well and has won a lot of matches for the club with the bat,” says Rathore. “We just worked on aligning his bowling action and also on his strength, after that he hasn’t looked back,” the coach adds. Nagarkoti went on to represent Rajasthan at the U14, U16 and the U19 level before getting a call-up to the Indian setup. The youngster impressed Rahul Dravid so much that he was even included in the emerging U-23 team which toured Bangladesh. “Dravid knows how to get the maximum out of every player, that’s one of the reasons he worked on the art of reverse swing right from the beginning with him and made him bowl with the older ball,” says Rathore. Dravid personally monitored Nagarkoti’s growth and was in constant touch with the youngster when he faced a lengthy spell on the sidelines right before the U19 World Cup. After coming back from the England tour where he was one of the star performers, Nagarkoti suffered a tear in his shoulder which ruled him out of any action for three months. The anxious youngster started his rehabilitation at NCA and that’s when Dravid restored his faith, telling him not to worry and that he would easily recover the lost time. His father, Lachham Singh Nagarkoti served in the Army for 33 years, retiring in 2007 as Honorary Captain and the mere mention of his son’s achievement made the former military-man emotional. “Main toh bas chahta hun aur aage bade aur senior team ke liye bhi khele,” says the proud father, who broke down while speaking about his son's achievements. He still finds it hard to believe that his son is grabbing the national headlines. Nagarkoti was invited for trials by Mumbai Indians but since he was 17 and hadn’t played in Ranji Trophy, he couldn’t sign a contract. With the auction around the corner, the youngster's coach is hopeful that some team might pick him up but he isn’t worried even if he goes unsold. “My main aim is to see him play in the senior Indian team, if he gets selected for IPL then well and good but even if he isn’t selected, it’s alright,” he says. The ingredients certainly seem to be there and under Rahul Dravid, the youngster couldn’t get a better guide. All Indian cricket fans will be keeping a keen eye, seeing how Nagarkoti progresses through the ranks and see where he ends up a few years down the line.